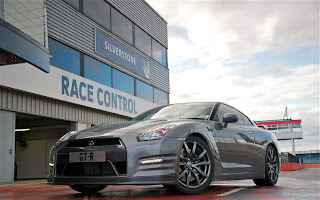 Automobile Magazine had a chance to drive a newly updated 2013 (2012 Euro) version Nissan GT-R at Silverstone circuit, and gives us their impressions. The 2012 GT-R, introduced 12 months ago, wasn't exactly growing long in the tooth. It could embarrass a Ferrari 458 in a straight line and out-handle most things this side of a racecar, but Nissan has gone and moved the goal posts, again. A raft of updates for calendar year 2012 (model year 2013 in the U.S.) -- bring yet more power, a bizarre asymmetrical suspension setup and a handful of tweaks to the interior. Several of the first drive journalists have commented on the top end charge of the 2013 car. Perhaps it really does have better breathing. Up to 5,000 rpm, it's a familiar experience -- as if I've become accustomed to the GT-R's other-worldly performance over the years and that initial slug has lost some of its sting -- but as the revolutions rise, the way this revised car charges for the rev limiter is all new. When will people be trying the new intake manifold on the early cars? We will have to see if its any kind of real gain, or just a small incremental gain. The 2012 inlet pipes seemed to give the early cars over 10 hp. In true GT-R style, the power boost has been achieved the hard way: not by reprogramming the ECU and bolting on a bigger exhaust, but by upgrading the V6's internals. There's sodium-filled valves in the exhaust pipe for improved cooling, tweaked cylinder heads, and a freer flowing intake manifold. Of course, the other benefit of improving the engine's efficiency this way is boost in fuel economy of 0.4 mpg -- Greenpeace won't be applauding, but every little helps. Four more years? R35 GT-R until 2017 from the sounds of it. So does that mean R36 in 2018 now? Some hybrid/electric runs on cat urine beast? What will really have the GT-R's rivals quaking in their boots though is that the GT-R still has four more annual updates to come before it's replaced. In the words of Mizuno, "the current car is about 80 percent of what's possible, there's still 20 percent still to come." They estimate the 2013 price to be right at $100,000. That will be a significant jump from 2012. Head over to Automobile Magazine for the full impressions.